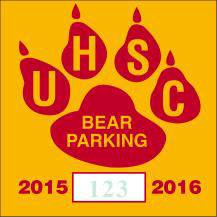 SQUARE PARKING PERMIT DECAL - color is (red imprint on yellow vinyl). Permit Size (trim size 3" X 3"). FREE PARKING PERMIT ART - with standard logos or mascots, or we can customize a decal or sticker with your seal, logo, or mascot at "NO" additional cost, when supplied with vector art, or just send us a sketch and we will create design. FREE CONSECUTIVE NUMBERING - height "7/32 inch". Call for additional size numbers. Our screen printed inks are fade-proof and weather proof. Choose from one of our standard colors with no additional cost printed on either white or yellow background. Call for second color or backside imprint.